The current state of the cryptocurrency market is quite unpredictable with a number of coins in the green, but most have lost significantly in the past 3 days. On Thursday, the market saw a strong rebound off its weekly lows, with many cryptocurrencies posting a gain of 5% at the very least. However, bears took over the market and we can only expect the best in the near future. There was a minor pullback last week in crypto markets. However, things have not been that good over the weekend and the total market capitalization remained constant at $200 billion for the last 24 hours. Altcoins are a mixed bag with more red than green on the boards since morning. 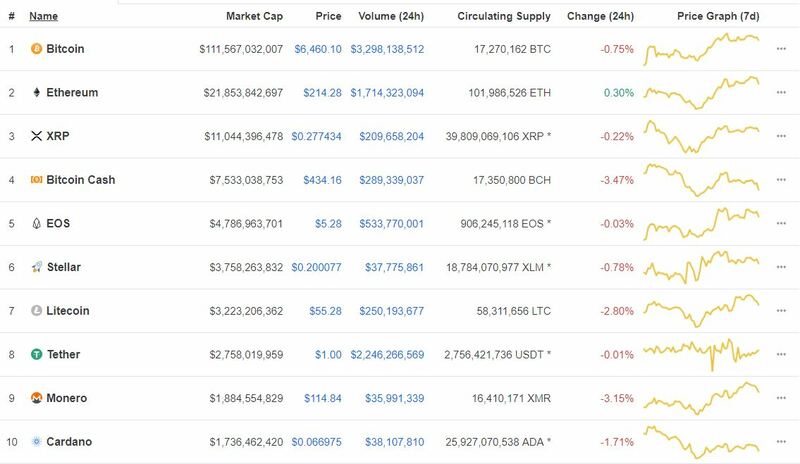 In the top ten, bitcoin cash, litecoin and Monero have dropped 2-3%, while the rest are flat with very little movement over the past day. This places the current state of the market at a static position with minor movements. For instance, bitcoin’s price lost a fraction since yesterday and is currently trading at $6,479. Ethereum had gained a cool 7% to trade above $200 but then dropped 3% in the last 24 hours. According to the chart below, it was much of the same for the coins in the top ten, save for Monero, Bitcoin cash and Litecoin, which all posted losses due to a number of factors. Nonetheless, most investors and analysts have their eyes on bitcoin and its likely movement in the near future. Additionally, investors such as Tim Draper, still believe that the total market cap will hit $80 trillion. Draper stated that once adoption increases and people become more familiar with cryptocurrencies, these will boost the market’s cap. However, it remains to be seen whether Draper’s prediction will come true. Do you agree with Tim that the market cap will hit $80 trillion in future? Moscow seeks to provide specia..
One of the well known brokerag..